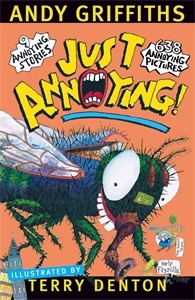 The series that began the creative partnership between Andy Griffiths and Terry Denton, which now encompasses eight Just! books, and are followed by the bestselling Treehouse series and many more. Take the ANNOYING TEST and find out. 1) Do you ask `Are we there yet?' over and over on long car trips? 2) Do you like to drive people mad by copying everything they say and do? 3) Do you hog the shower and use up all the hot water? 4) Do you enjoy asking silly questions that have no real answers? 5) Do you swing on the clothesline whenever you get the chance? SCORE: One point for each 'yes' answer. 3-5 You are obviously a very annoying person. 1-2 You are a fairly annoying person. 0 You don't realise how much fun being annoying can be.